Texture drives design style in these close colors. Some flowers that support the look and feel are ‘Moreno’ and ‘Gypsy Curiosa’ Roses, Orange Lilies, ‘Choco’ and Red Anthuriums, Leucadendrons, Leucospermums, Kangaroo Paws, Celosia, Hypericum and Epidendron Orchids. Experience the return of earth tones with a sense of luxury. This rich, analogous color harmony ranges from deep mahogany hues to terra-cotta, clay, carnelian red and rose tones with a copper accent. Warm and sensuous spice tones simmer to top notes of pink, while deep cocoa, caramel and coffee tones cooked to gooey perfection, tempting the senses. It is about organic elements—glazed ceramic, worn leather, stitching on leather, textured metals, worn and suede surfaces. 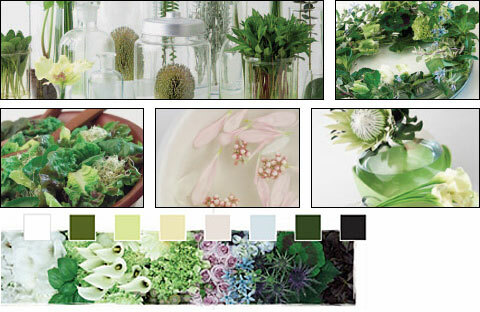 The emphasis is on health and well being, with green dominating this palette. Water and glass merge with botanicals, creating a spalike feeling. In this state, things are simple and clear—a sanctuary by design. 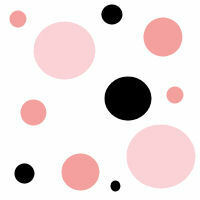 Based off of white, a licorice hue accents the palette, and you’ll also find a lilac ash and illusion blue, as well. Clinical and clean best describe this presentation. Floral materials that support the feeling are ‘Super Green’ and ‘Jade’ Roses, ‘Green Goddess’ Callas, Green Cymbidium Orchids, Green Gladioli, Green Anthuriums, King and Queen Proteas, Banksias, Grasses, Herbs and Ferns, as well as monobotanical foliage presentations. A midrange medley of earth colors with a vintage feel are layered to create this look. Find archival patterns juxtaposed with Asian motifs and flea-market finds. Embroidery, chiffon and filigree are at home here. Souvenirs of travel as well as favorite and sacred items are unabashedly collected side by side, exposing the layers of life’s experience. The style is casual and weedy and is given to unexpected combinations. Flowers that support it are ‘Sahara’ and ‘Peppermint’ Roses, Lisianthuses, Gerberas, Asiatic Lilies, Ranunculi, Hydrangeas, Stocks, Mums, Cottage Yarrow, Festival Bush, Tweedia and GrassesÑand for a twist, mix these botanicals with Proteas or Leucospermums. Begin with a color foundation to live with. 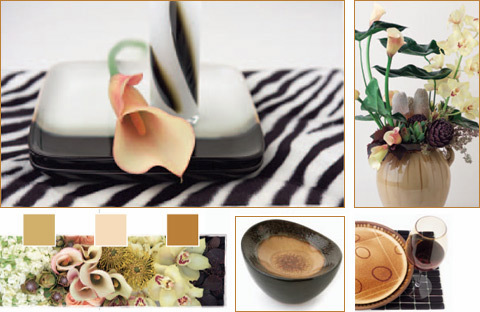 Black and white is warmed by brown to create a neutral background for infusions of color. Black and white floral prints are waiting to be painted in with fresh flower colors. In a world where color is celebrated by the media, with television programs, shelves of interior magazines and celebrity designers, it has captured the public’s imagination. It is no longer a trade secret that a quick infusion of color can more than change your surroundings; it can change your mood and your sense of well being. Named for the rose that is this color, ‘Black Baccara,’ the Baccara Infusion dares to live with deep mysterious shades of red. Tempered with browns, it becomes a rich and sumptuous refuge. Here you find classical elements punctuating the neutral landscape, creating a classical elegance. Marked by opulence and luxury, rich textures and layers of close burgundy related tones define this look. ‘Black Magic,’ ‘Bull’s Eye’ and ‘Black Baccara’ roses are only a few rose varieties that create the feel. ‘Sumatra’ and ‘Cobra’ Oriental lilies provide not only the color but the scent. 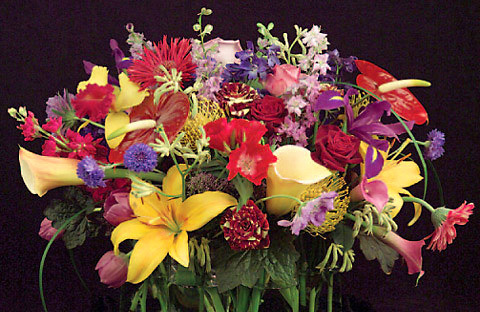 Callas and Cymbidium orchids imbue style while Celosia, Coral Bells, Amaranthus, Cone Flowers, Dahlias, Chocolate Cosmos, Coccinea and Kangaroo Paws provide texture. When these botanicals are mixed together, the end result is lush. The name says it all — caramel, honey, toffee and an exotic elixir come home to a new realm of comfort colors. The aesthetic is subtle yet sublime, neutral but never dull. The look supports curves and softness. Our senses are lured not only by the color but also by the feel. Here we taste and experience luxury in the sanctuary of our own homes. Rich glazes, warm surfaces and amber hues combine to create a modern chic. This style is uncomplicated and comfortable. Wooden vessels, glazed ceramics or amber to brown glassware are appropriate container choices. Cymbidium Orchids and Callas provide soft curves and perfect colors. ‘Leandra,’ ‘Citronella’ and ‘Limona’ roses all fit the color harmony while Leucadendrons, Leucospermums and Banksias all provide the color and a nod to the exotic. The sueded brown backsides of Magnolia foliage finish the look. Traditional and always favored, the tones of lilac, purple and plum exude a modern twist. 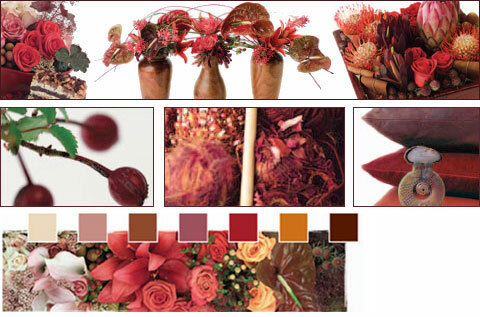 These colors, defined by richness, become even more sophisticated juxtaposed with brown. The subtleties and nuances read in brown’s quiet presence. Rich silk pillows, brown fur throws and tone-on-tone motifs create a quiet and royal aesthetic. Mother Nature loves these colors, and that is obvious in the abundance of flowers that grow in them. Orchids in all varieties set the tone here. ‘Blue Curiosa,’ ‘Delilah,’ ‘Cool Water’ and ‘Mystery’ varieties of purple roses provide range in color, with ‘Mystery’ roses even sporting a brownish cast. Stocks reign supreme for this color harmony, with a full range of jewel-toned colors. Gerberas, Lilies, Waxflowers, Callas, Gladioli, Delphiniums and varieties too vast to mention all suit this look. While the presence of deep denim remains strong, the mood is changed as it is paired with deep turquoise and accented by emerald green. This fashion-forward look goes from cool during the day to urban-chic at night. Clean, elegant and uncomplicated lines let the colors take center stage. Smooth ceramic glazes in teal, blue and green as well as blue glass vases and shallow bowls are perfect vessels for this look. Where there is glass, there is water and light. Play off of multiple vases in close hues of blue and teal to create a dramatic effect. Not only are blue blossoms such as Delphiniums and Irises enjoyed here but also the glamour flowers of the ‘40s and ‘50s really shine. Cattleya and Cymbidium Orchids, Gardenias and Callas all become Hollywood stars. Beyond infusion we find profusion. It’s become cliché to deliberate on how chaotic our world has become. Yet in the realm of nature, chaos is the wellspring of inspiration and great beauty. Ongoing in ornamental horticulture is the desire to redefine the ways in which we express ourselves with flowers. Growers continue to cultivate new varieties while designers continue their remix, and in the process of this, beauty is redefined.